Join us for a special “Mermaid Hippening” at the OCCCA on Saturday, June 22 from 6-10 pm, presented by the Isle of Love One Love…One Earth…One World Ocean Forum. A magical evening of Visual Arts, Flow Arts, Wine and Dancing. Find out how you can bring the Mermaid Sanctuary into reality! See videos of real live mermaid performers and see how you can swim with mermaids too. Featuring mermaid enchantments, pirate enactments, live roaming mermaid muses in costume! Photo Ops with mermaids, mermaid oracle card readings, flow artist performances outside and in the black light room, music & dancing. FREE ADMISSION to a magical evening of Visual Arts, Flow Arts, Wine and Dancing. Find out about our Manatee and Sea Turtle Preserve called the Mermaid Sanctuary and how you can bring the Mermaid Sanctuary into reality! Watch videos of real live mermaid performers and see how you can swim with mermaids too! – Join the Mermaid Sanctuary Campaign, launching this night on indiegogo, and enter into the drawing for a trip to Belize! 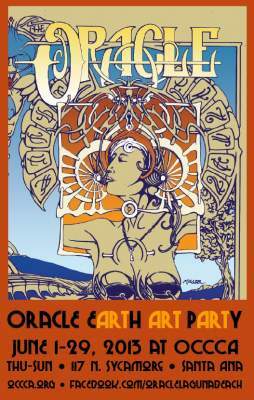 The Mermaid Hippening is part of an all month celebration of the newly revived Oracle Magazine, which supports the arts in all its forms. Throughout the month of June, the EARTH ART PARTY is hosting weekend “Hippennings, Happennings, and Hopeinings,” combining celebrations and parties, the arts, and worthy causes to help the planet and our global community. Learn about why Mermaids and the One World Ocean Conservation and Manatee Preserves are important, and about the building of a Mermaid Sanctuary in a fun, interactive, experiential format. Come get a taste of Experiential Entertainment in one of its many forms. Participating artists include: Jesse Miller, Marijke Koger-Dunham, Ricardo Duffy, Janelle Higgins, Elizabeth Zaikowski, Robert Shields, Gregg Stone, Roy Gonzalez, Autumn Skye Morrison, Michelle Hutchenson-Holt, Mark Henson, Hedi Schoop, Carolyn Ferris, Rodney Nelson, Ryan Gourley, Bill Ogden, Marcel Mead, Kim Hix, Paul Heussenstamm, Terrell Washington Anansi, Leti Stiles, John Chaney, Rourke Gourley, Richard Bohn, Victor Payan, Andrew Glassell. Special Black Light Room featuring: The Black Light King, John Lucero, Star Shields, Bridgitte Charlotte, Roger R. Eyes and Vizionary. For information: visit www.facebook.com/OracleLagunaBeach or www.occca.org or contact Oracle Concierge Star Shields at 949-939-4363 or starmanair@gmail.com. For more information, contact Star Shields at starmanair@gmail.com or 949-939-4363.